St.Joseph's Institute of Management Associate Professor/Assistant Professor Jobs. For these jobs you can apply from 22-03-2019 to 31-03-2019. They required 2+Years teaching Experience for St.Joseph's Institute of Management Assistant Professor Job. 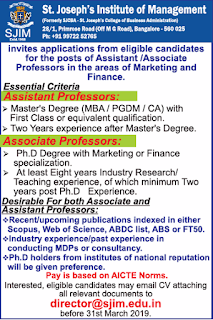 For more details refer the official website http://www.sjim.edu.in/about.php for Associate Professor/Assistant Professor Jobs recruitment 2019. More details Like Selection Process, Important Dates, Qualification, Salary and e.t.c. Are available given below. 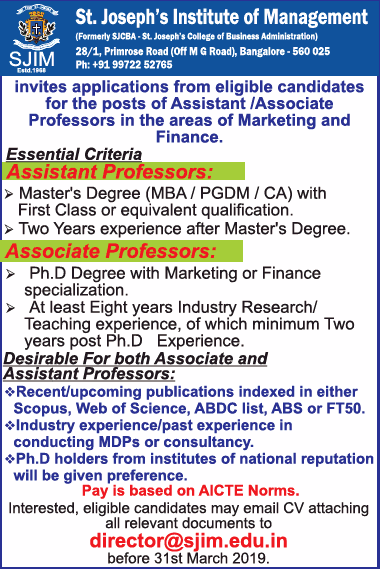 Starting Date to apply for Associate Professor/Assistant Professor Jobs: 22-03-2019. Ending Date to apply for Associate Professor/Assistant Professor Jobs: 31-03-2019. Eligible candidates are requested to send bio-data with all relevant certificate copies to the email-id address given below. Last date is 31-03-2019.